Package of 40 Memorex Format CD Labels 20 Sheets with 2 CD or DVDR Labels per sheet. Compatible with the Memorex Label Maker format (Not Memorex Brand). These CD, CDR Labels are made from White, Matte, Smudge Proof Stock, with CD Safe Acrylic adhesive. 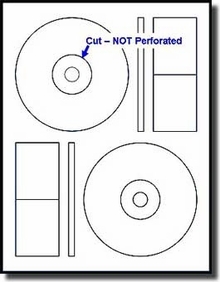 There are two CD "Donut" labels with the center hub label (Note; this is the Older style where the center hub is cut, not perforated), plus two large labels, and two spine labels per sheet. These CD labels are guaranteed usable with either ink jet or laser printers.